As part of SusFestival19 Look! St Albans will be hosting its first Placemaking event on Monday 20th May 2019 at the Octagon Room, St Peter’s Church, St Peter’s Street, St Albans AL1 3HG starting at 18:45 and finishing at 21:30. We hope to hold similar events on a regular basis. 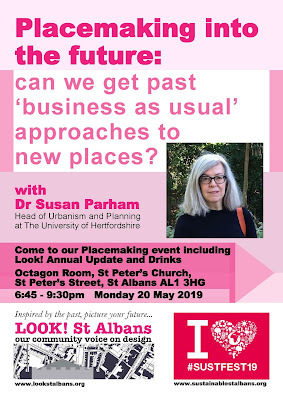 This talk will explore some existing and planned examples of placemaking that finds ways to avoid bog standard approaches to making new places. It will explore examples from Hertfordshire and beyond that show how places can be sustainable across a range of themes: housing, streets, food, movement and walkability, energy use, water and air quality, services and infrastructure, and employment and social life. The talk will reflect on how to get there - with a focus on engagement methods to help create these sustainable places. Starting at 6:45pm with drinks, Look! St Albans will hold its AGM at 7pm to be finished as expeditiously as possible to allow our speaker to start at 7:30pm ending at 9:30pm. All are welcome!